Blinds have many advantages over curtains but, if you’ve not had much prior experience cleaning blinds it can feel a real hassle to keep them in good condition. Dirty blinds really impact how clean and fresh a room appears, particularly if you have conservatory blinds which really dominate a conservatories decor. As with many household cleaning tasks the best strategy to keep your blinds clean is little and often, you can avoid the time consuming and frequently fiddly ordeal of taking your blinds down to wash by simply giving them a quick scrub every week or two. If you have Venetian or vertical blinds the best way to do this is to mix a solution of hand washing detergent and warm water, then take a sponge soaked in the solution and fold it over the blind and applying pressure with your thumb and finger drag it across the length of each blind. With vertical blinds it is best to do this from top to bottom. Once the blinds are clean, do the same again with a clean cloth and just water to rinse off the soap. If the blinds are not made from fabric it can be a good idea to complete the process a third time with a dry sponge or towel to dry off the blinds and avoid smearing, or with metal blinds rusting. If it’s been a while since the blinds were clean a lot of dirt and dust is likely to have built up, in this instance you may find the method above just pushes around the dirt and maybe even makes the condition of the blinds appear worse. If this is the case you will likely have to take the blinds down to clean them. Some blinds are machine washable, and so the easiest way to wash these is just like that in the washing machine. 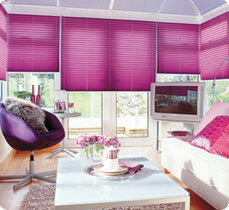 To stop the blinds being damaged however it’s advisable to wash the blinds at a fairly cool temperature. It is also a good idea to roll up the blinds and put them in an old large sock, or if this isn’t big enough try a pillow case. This will help prevent the blinds from fraying or damaged in the wash. If the blinds aren’t machine washable and aren’t dry clean only giving them a bath can be a very effective way of getting them clean. This works particularly well with metal blinds. Fill your bath with enough warm water to cover the blinds, mixed with some dish washer detergent, leave the blinds to soak for a while as this alone will remove much of the dirt. Once the blinds have soaked for a while, wipe them with a sponge, then drain and refill the bath with clean water to rinse. Once the blinds are clean dry them. A tip to speed up drying fabric blinds is to use a pair of hair straighteners on them – although do test a small area first to make sure the blinds can withstand the heat, and ensure the hair straighteners are safe to be used on wet surfaces. Once they are dry you can hang them back up and enjoy how much cleaner your room now feels. As with any cleaning tips it is important to check the labels of your blinds as these cleaning processes may not be suitable for all blinds.